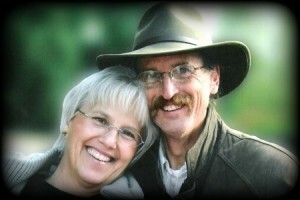 GARY and KAREN GREENO have been entertaining young children and bringing delight to all ages through music in one form or another for most of their adult lives. Music is their passion, and it shows in each new smile that lights up a young face. Find out when children’s music classes are available near you, invite Karen to do a preschool teacher training in music, purchase one of their children’s music cd’s and find many parent music resources they’ve gathered. GARY GREENO has had one of the most unique musical journeys around. Gary began his career as a Music Therapist helping developmentally delayed individuals. 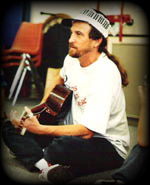 He then facilitated the creation of an Infant Stimulation Program and as resident Music Therapist helped infants and toddlers in physical rehabilitation to progress through physical discomfort, gain improved communication while better expressing feelings, and enhancing memory by using music therapy to stimulate thought processes and emotions. In 1984 he created Kids Love Music and began using his extensive experience working with infants and young children in a new way. Whether working with young ones at school, adults in a workshop, or a mixture of ages in a concert setting, Gary’s unique gift drew everyone into his energetic musical activities. Due to health conditions, Gary has retired from active teaching. He continues to support Karen on the home front. KAREN GREENO is a joy to hear singing with kids, whether it is in a small group setting or in a large concert for a school. As a credentialed teacher, Karen spent two years teaching the second grade. Then following in a musical vein, she taught elementary school music, as well as being the choral director for the upper-grade choir. A gifted singer and musician, she has been bringing musical fun to young children since 1986, when she joined Gary in the Kids Love Music endeavor. One of Karen’s specialties is initiating delightful interactive moments between parents and children in her Parent and Me Music Classes. 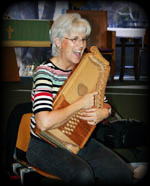 Karen’s ability to bring a group of young children along with her on a musical journey is a pleasure to experience.